My father, Wyndham Richards, was teaching in an elementary school in Cardiff in July 1914. As soon as the summer term ended, he took a train to Berlin in order to undergo a month’s cramming course in German. When war broke out eleven days later, his four weeks turned into a nightmare four years. What he did, and how he survived, is told in the detailed diaries that he kept during his incarceration, firstly in Ruhleben, which was a Trotting Racecourse, then in a Berlin prison, and finally in a Military Camp for troublesome escapers. These diaries, which were found in the family house thirteen years after Wyndham’s death in March 1966, have been interpreted and transcribed, and then published on July 24th 2014, exactly 100 years after the original sortie into Berlin. 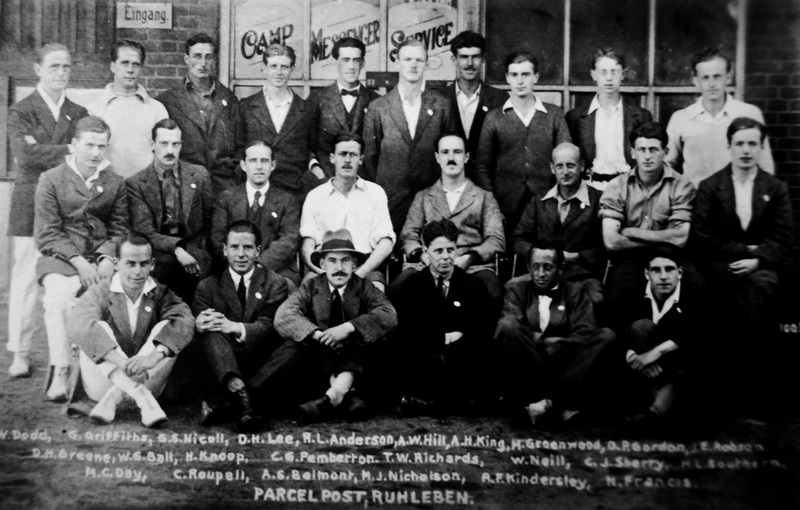 Wyndham with the Parcel Post staff in 1916 (pictured fourth from the left). 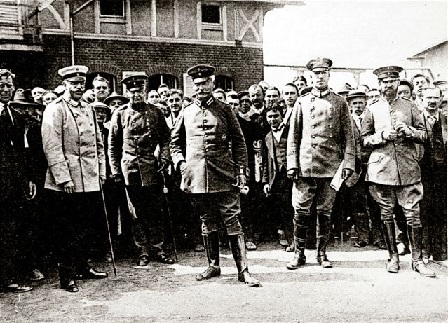 When Britain declared war on Germany on August 4th 1914, all of the British civilians living in Germany were, in the first instance, allowed to remain free as long as they registered each week at a designated Police station. However, on November 6th, everything changed. British civilians residing in Germany were rounded up and interned as an act of retaliation for the British action against German nationals in the U.K. No preparations had been made and the designated destination for the British civilians was a racecourse, with three grandstands and a series of horseboxes. The prisoners were marched in and placed six-to-a-box, until all the boxes were full, and the haylofts were filled up. There were men of all ages and backgrounds, as no-one had expected war, if it came, to have any effect on the civilian population. There was nothing for the prisoners except straw and a blanket each; the motley crew had to face a bitterly cold winter together. 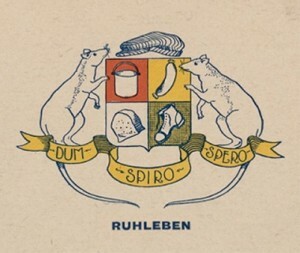 The Ruhleben Coat of Arms- The Quarterings contain: a soup, a black loaf, a German sausage and a clog together with a rat and mouse as supporters. Yet within days, a football tournament had been arranged and played, and after nine months, the prisoners had so organised themselves that they were able to persuade the German guards to withdraw from the camp, leaving the prisoners to run themselves. Moreover, they had football leagues, cricket leagues, a thriving school, a busy theatre, an orchestra of 70 musicians, an excellent camp magazine, a post office and a parcel post office, a police force – in fact they had a complete community – a British colony in the middle of Berlin. But they were not free. Wyndham’s diaries show all the frustrations caused by this loss of freedom, together with his own determination to escape. For well over two years, he worked in the Parcel Post Office, which at its peak was handling over 1,000 incoming parcels each day, and he was relentless in his pursuit of knowledge, attending classes in German, French and Spanish on a regular basis. His diaries only give hints about escaping. It was not until April 2014, when a note in his 1919 diary led to the discovery of two articles Wyndham wrote in the local newspaper on his repatriation in November 1918, that it was possible to find out how he got out of the camp. Of course, he later often left the camp regularly as a trustee, but the gentlemanly code of conduct operating at that time prevented any thought of escape arising on those occasions. His adventures after his final escape in October 1917, including his spell in the ‘Dark cells’ of the stadtvogtei in Berlin and his shocked arrival at Havelberg Military Camp, are all fully described. Camp administration: Baron Von Taube is in the centre and Count von Schwerin (Commandant) is with the switch on the left. The diaries also address fascinating questions such as: How did prisoners get enough food, when Germany was starving? Who were the guards? Why were there so many German-speakers locked up in Ruhleben? How did they achieve such high standards in their schooling, music and theatre? How did many of the Ruhlebenites escape and how did they eventually get home? How did prisoners get any money to spend? and What happened in Germany in November 1918? There are just so many. 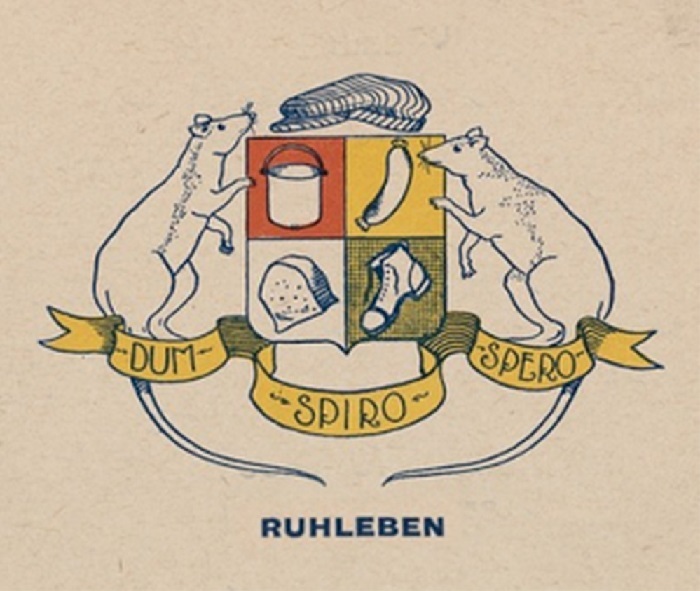 The diaries are, almost certainly the only ones of Ruhleben inmates that have been published. There are some unpublished diaries in the Liddle Collection in Leeds University Library, and many discussions have been held with Peter Liddle who has done a remarkable job in collecting memorabilia and recollections of the First World War veterans. Much of Wyndham’s text was written in German script and much is actually in German. 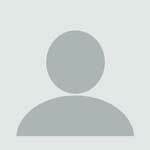 Some is unreadable and some unintelligible. But if it has been readable, it has been printed, warts and all. Derek Richards was born and grew up in Cardiff. He was educated at Cardiff High School for Boys and Merton College, where he read history. An accountant by profession, he maintained his interest in history and has been, for the past ten years, a volunteer warden at Talbot House, Poperinge: an important place of rest and recuperation for soldiers in Flanders in WW1. To purchase a copy of 'Wyndham's War' please contact Derek Richards on: d.richards93@ntlworld.com. This entry was posted in From Space to Place, Strange Meetings, The Memory of War and tagged 070 (News media journalism publishing), 355 (Military science), Blogs, U (Military Science). Bookmark the permalink.